WINNIPEG -- Jonathan Toews was hailed as a conquering hero three years ago when he brought the Stanley Cup home to Winnipeg after leading the Chicago Blackhawks to their first championship in 49 years. After the Blackhawks won again this spring, Winnipeg's favorite son didn’t hesitate when it came time to decide where to spend his time with the Cup. "It's my hometown. I grew up playing hockey here. It's where all my friends and family are. They deserve to take in this moment too," Toews said Friday at the conclusion of a long day of activities throughout Winnipeg. "For me, it's special that other people are genuinely happy to see the success of our hockey team. It's definitely cool to see. I'm appreciative of that." That appreciation was evident from the moment hockey's biggest prize arrived at Winnipeg International Airport on Friday morning. After hoisting the Cup in the middle of the terminal, Toews was determined to share his big day with the community. BOSTON -- Shawn Thornton's love for being a Bruin goes well beyond his wearing of the sweater every game night. Since he arrived in Boston as a free agent in the summer of 2007, Thornton has immersed himself in the culture and people of the Hub. That immersion continued Tuesday when the Bruins' veteran right winger used his second day with the Cup to share it with the people of his "second hometown" of Charlestown and others that have become part of his life throughout the city. "The people have been unbelievable to me ever since I got here," Thornton said. Thornton is a native of the Oshawa, Ontario area, but he and his wife have settled in as year-round residents of Charlestown and it seems he's made friends with everyone in the town. Those friends turned out in droves at numerous unpublicized appearances all morning. DAVISON, Mich. -- The smell of the field's freshly-cut grass reminded Tim Thomas of the up-downs he used to sweat through when he was a football player. The sight of his old hockey coach brought back all the lessons Tom Barrow used to give Thomas about patience. The familiar faces in the crowd included some of the people he used to work with at Domino's when he was a pizza delivery boy. His old house is still standing, still owned and occupied by a cousin. The grocery store Thomas used to work at is gone now, but the parking lot at Woody's Produce where he played street hockey day and night still remains lit for another dreamer. If only someone could find those old nets made of 2 x 4s and chicken wire. If only they could talk. Thomas didn't arrive in Davison until November of 1988. He had some family living in town and he didn't come from far so his transition was easy as he enrolled in the high school as a freshman and began to live a humble, normal and relatively quiet existence in this humble, normal and relatively quiet town. VANCOUVER -- Milan Lucic always knew that if he was lucky enough to get the chance he would spend his day with the Stanley Cup celebrating in his hometown with his large family and closest friends. The only catch was that to make it happen, the Boston Bruins' powerful winger couldn't let himself pour salt on the millions of open wounds in and around Vancouver. "I didn't want to rub it in," Lucic told NHL.com before his festivities began Sunday. "I grew up a Canucks fan. I know how it is." The local boy turned enemy champion made what seemed like an impossible task look easy. His calculated and intelligent decisions about what to do with the Cup created a lifetime of memories out of a 14-hour day. MAPLE RIDGE, B.C. -- Cam Neely did yet another double take. The 46-year-old memeber of the Hockey Hall of Fame has been doing a lot of those lately. "Sometimes you have to pinch yourself and say, 'Oh my god, the Stanley Cup is right here. It's pretty cool." Sitting about 18 inches behind his left foot was the trophy he sweat and bled for as a player but never could legally (in hockey player terms) get his hands on. Nowadays, the Boston Bruins' President and Alternate Governor wants his fingerprints all over the Stanley Cup. This week's show features the Stanley Cup in Europe. Marian Hossa and Tomas Kopecky enjoyed the Cup in their native Slovakia; Niklas Hjalmarsson took it home to Sweden; and in a first for the Cup, hockey's most hallowed trophy visited Paris and the Eiffel Tower. 'Lord Stanley's Summer' debut to feature Cup in B.C. "Lord Stanley's Summer," a three-part series following the Chicago Blackhawks and their time with the Stanley Cup, will premiere Tuesday at 7 p.m. ET on the NHL Network. The first episode will feature Norris Trophy winner Duncan Keith, Brent Seabrook and Troy Brouwer celebrating with the Cup in British Columbia. In a province generally consumed by its love for the Vancouver Canucks -- and considering how the Hawks have knocked the Canucks out of the playoffs the last two seasons -- there was no lack of love shown the three local NHL champions. MIDDLETOWN TWP., N.J. -- Mike Haviland spent a good portion of his childhood playing hockey with his two brothers. Naturally, they'd always play for the Stanley Cup. Fast forward three decades to a sunny Sunday afternoon on the New Jersey shore. 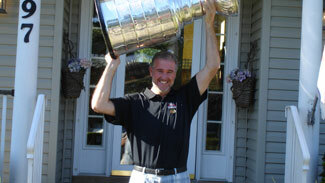 There was Mike Haviland, now 43 years old, sharing hockey's Holy Grail with family, friends and neighbors in celebration of the Middletown native's big day with the Stanley Cup. "It's so surreal," said Haviland, an assistant coach with the Chicago Blackhawks. "I never thought it'd be this overwhelming … just the outpour of people. It has been crazy. Maybe I didn't understand the magnitude of New Jersey, but the people here are hockey fans. It's amazing to see." Governor Pat Quinn today welcomed the Stanley Cup and Chicago Blackhawks owner Rocky Wirtz to Springfield as the Cup continues its victory tour of Illinois in honor of the Chicago Blackhawks' historic NHL Championship win. "The Blackhawks' overtime win against the Flyers was celebrated in every corner of our great state, so it is fitting that the Stanley Cup is traveling all over Illinois to see the fans," said Governor Quinn. "I want to thank the Hawks for bringing the Stanley Cup to Springfield. I hope everyone puts on their Blackhawk red and black to come out and celebrate." After a brunch at the Executive Mansion with members of the United Service Organizations (USO) and the Wirtz family, the Cup arrived at the 2010 Illinois State Fair for an official unveiling in advance of its public display on Saturday. "It serves him right," Toews cracked to NHL.com Friday. "They should have left him up there all day." Kane eventually made it back down to earth after two mechanics fixed the motor that operates the ladder. He was suspended in the Buffalo air for about 20 minutes and came down shaking and tightly clutching the Stanley Cup.